Martin Walker is the author of the Bruno Chief of Police series which are set in St Denis. He splits his time between Washington DC and the Perigord. He has written several acclaimed works of non-fiction, including The Cold War: A History and is a prize-winning journalist. 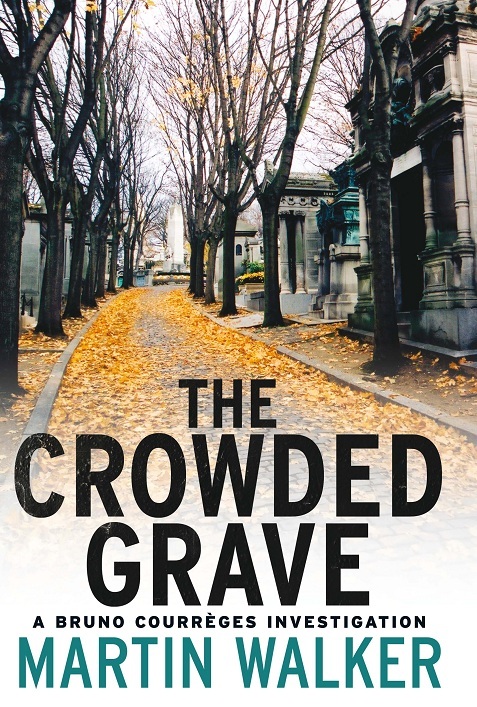 The latest book in the series is The Crowded Grave which is the fourth book in the Bruno series. His blog is devoted to the Bruno novels and you can also find information about the books but also recipes. It is somehow deeply satisfying to be woken by one’s own organic alarm clock. He’s called Sarko, after his country’s President, and he is the kind of proud and magnificent cockerel that French rugby fans bring to Twickenham to show their team the way to the English goal line. Sarko wakes with the dawn, whether that means 8am in winter or 5am in summer, and makes it plain that everyone in the vicinity should be joining him in greeting the new day. His immediate target is his harem of four hens and our family basset hound, but he inflicts collateral early-morning damage on any humans within hearing range. We only had one complaint, from a Parisian family who had rented a house in the village for the summer. They turned up shortly before noon to ask if Sarko could be silenced. This is the sacred hour le petit apéro, when any good citizen of Périgord is enjoying the first pastis of the day with the neighbours. By chance, one of those present that day was Raymond, a retired Commandant of Gendarmes, who pointed out to the Parisians with great courtesy that if they could not appreciate the sound of an early morning cockerel, perhaps they should not have chosen to holiday deep in the French countryside. They accepted the logic of this, stayed to enjoy a glass of Ricard, and left with four fresh eggs. When their holiday ended, they came to say goodbye to Sarko and say how much they’d miss waking to him. This is a rather roundabout way of saying that the Bruno novels, based on the adventures of a French country policeman, are as much documentary as they are fiction. Perhaps because I spent so many years as a reporter and foreign correspondent for The Guardian, I tend to write about things that I know or that I see. The weekly market I describe is pretty much the one I attend on Tuesday mornings, with the stalls selling local wines and vegetables, fish and charcuterie, honey and roasting chickens and crottins of dry, half-dry and creamy goat cheese. The main street and the Mairie and the café and the old church with its sound of the choir at practice are the ones I know. Many of the plots are drawn from life, like the tensions between Chinese and Vietnamese communities, or the impact of the closure of a sawmill, a significant local employer, after a campaign against its polluting chimney by Green activists. The complex political campaign required to get an Appellation Contrôllée for a nearby wine area tuned into the plot for ‘Dark Vineyard’ and the archaeology in ‘The Crowded Grave’ was inspired by sites and digs within strolling distance of my home. And the attacks on local duck farmers by animal rights activists who condemn the manufacture of foie gras as cruel also stems from events in the valley. And it is sadly the case that some of these campaigners know so little of the cause they champion that they don’t know that ducks and geese stuff themselves and swell their livers to store energy before their long migration flights. Bruno himself is modeled on our own village policeman, Pierrot, who is also my tennis partner and my guide to hunting truffles and then cooking with them. Raymond the retired gendarme has inspired another character and so have most of our neighbours and friends in the valley of the river Vézère in the heartland of France. But something is about to change. Next year Bruno starts to be published in France, by Editions Lattès of Paris, who are re-launching the famous old imprint of La Masque with Bruno as the lead title. Since La Masque, with its iconic black and yellow covers, was the imprint that launched Agatha Christie in France this is a great honour. But it also means that all the friends of neighbours will at last be able to read what so far they know mainly from hearsay and legend, and what they hear from the growing numbers of German and Swiss and Scandinavian tourists who approach Pierrot in the market, accuse him of being Bruno and demand that he sign their books. The success of the Bruno novels in Europe has brought film crews and TV cameras and reporters from Germany and Switzerland and Austria to our district. The waitresses in the café where I take my morning croissant now know about camera angles and lighting. The women of the village are growing so accustomed to being filmed as they are kissed by Pierrot during his patrols that they are now demanding advance warning so that they know to get their hair done and apply their make-up. Old Vaquot, the village boules champion, complains that his wife bullies him to get a shave whenever the cameras turn up, much to the disappointment of the film crews who think he’s far more picturesque when he’s hairy. We have developed a tradition over the years that with the publication of each of the four Bruno novels so far, we throw a dinner party for the usual suspects. Pierrot and the baron, Gérard the Mayor and Stéphane the cheesemaker, Raymond the retired intelligence man and Joe the old farmer, all gather with their wives on our tarrace. We offer copious amounts of good wine and then I give a brief outline of the plot while dwelling at greater length on the glory of Périgord cuisine, the beauty of its women, the charm and ingenuity of its inhabitants and the effortless way they outwit the politicians of Paris and the bureaucrats of Brussels to protect one of the world’s most enviable ways of life. This goes down very well, since each new book is dedicated to one or another of those folk around the table, and a grand time is had by all. Above all, the village feels it knows what’s going on in the books. Bu now they’ll be reading the books in their own language and I confess to more than a touch of nervousness at their reaction. Partly it’s because after the heart-warming welcome they have given the Walker family over the years I’d hate for them to be upset or disappointed. But it’s also that I don’t want our pleasant life in the valley and their behavior to change. I’d hate it if they suddenly stopped relating the local gossip every time I turn up, for fear that it might end up in another book, or if anyone took offence at the thought that one of my characters was a little too much like someone in real life. I dread the thought of tables in the café falling silent at my arrival, rather than invite me to join in the latest political row or sign the latest petition against this or that. It is, of course, my own fault. By writing about a place that I know well and for which I feel a very deep affection, I intrude on the lives of people and of the community however much I explain that I write fiction and that the stories and characters are all invented even if they were inspired by local people. And my fascination for French history opens a whole new kettle of troublesome fish. When I write about the way families still don’t speak to each other or let their children marry because of wartime feuds between those in the Resistance and those who collaborated rather too long, I am trespassing into a deeply personal and sensitive area. When I write of the way Algerians were rounded up, manacled and tossed into the river Seine to drown in 1961, it is historically true but not the kind of history of which people like to be reminded, least of all by a foreigner. I’m on slightly safer ground when I cite 17th century court documents on witchcraft and a black mass being celebrated by a royal mistress to secure the king’s affections, but I suspect the village priest will have something to say when we next share a beer at the rugby club. And one thing I pretty sure will happen is that every meal in every Bruno novel and every recipe I describe is going to be dismissed as quite the wrong way to go about preparing such a dish by just about everybody I know. 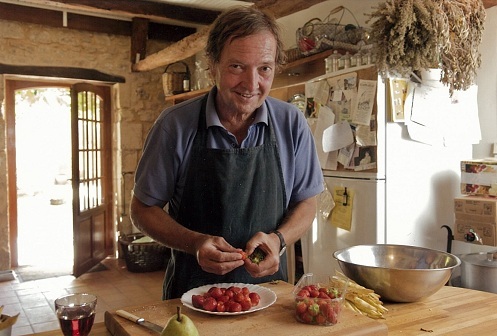 No two French cooks will ever agree on the perfect way to prepare a blanquette de veau or a civet de lièvre or even a simple tourain soup. The good part to this is that I can confidently expect lots of invitations to meals at which I will be presented with the right way to cook this or that dish. 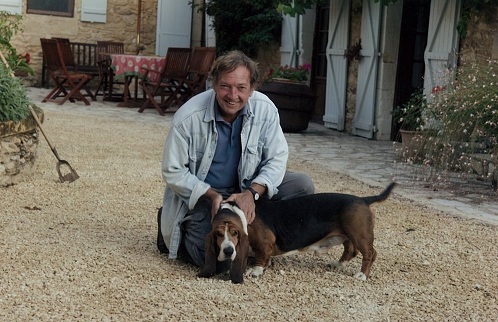 And I can be sure that the bottle of good Pécharmant wine I will take along to such feasts will inspire us all to agree that nobody outside the Périgord really understands or appreciates the quality of the wine the Bergerac can produce.